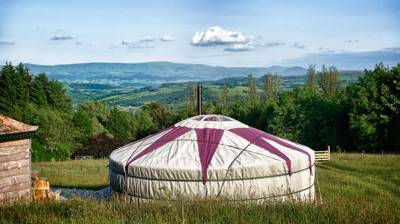 Curlew and Skylark, two authentic Mongolian Yurts perched on a hillside high over the Wye Valley. 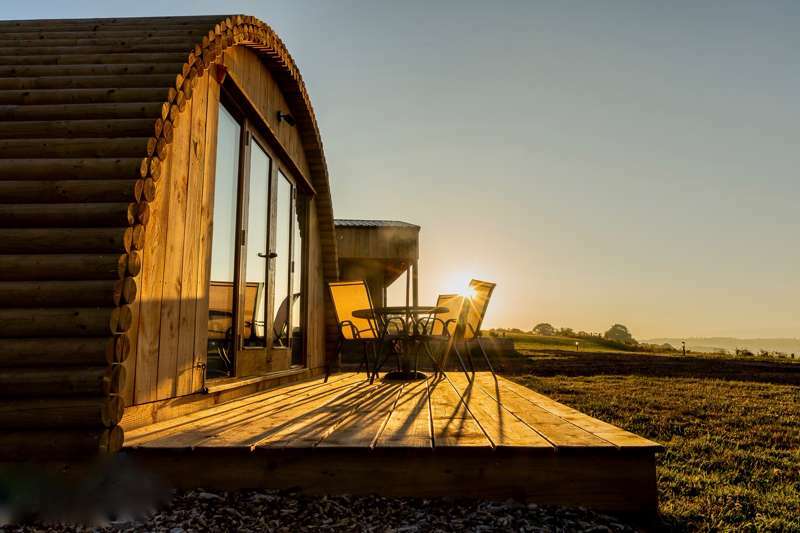 With fully equipped kitchens and private compost toilets, both yurts have stunning views from the decks and beautiful walks straight from the gate out onto 5,000 acres of wild moorland. 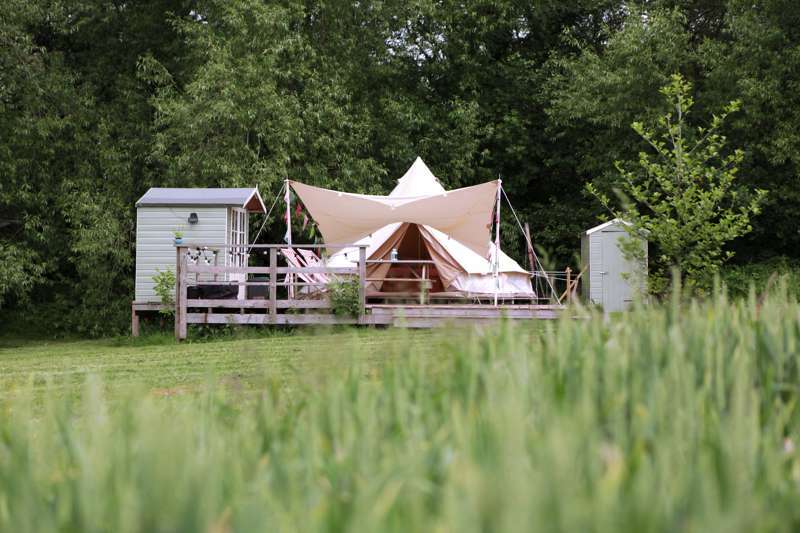 Brecon, Hay on Wye and the Brecon Beacons National Park are all within easy striking distance or just sit on the deck and watch the kites circling overhead or, once the sun has set, sit round the fire and look for shooting stars. 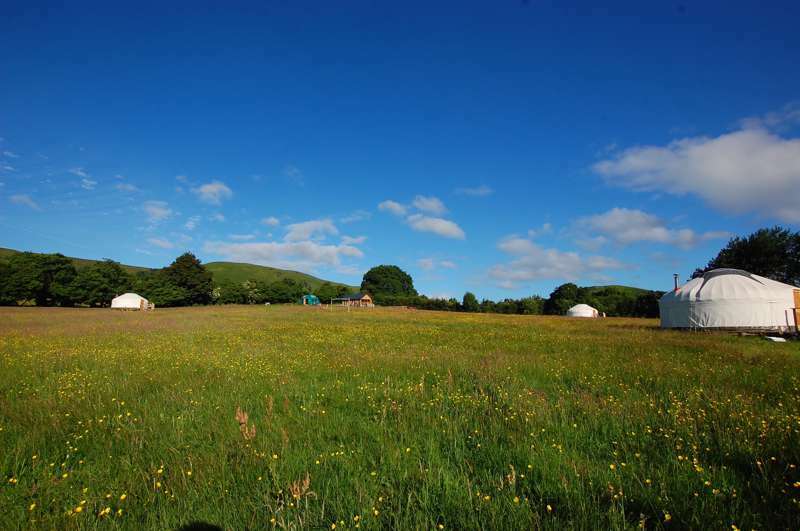 For latest availability and best prices for Kite Hill Yurts, please use the Date Search above. 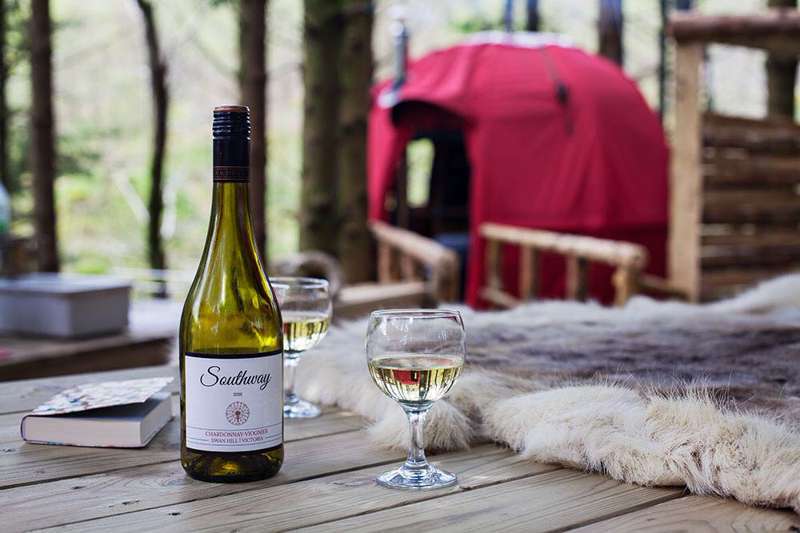 Yurts, lit by tea lights and lanterns, have wood-burning stoves, armchairs, beds and bedside tables, outdoor decks with seating and picnic table, a fire pit and a Weber BBQ. 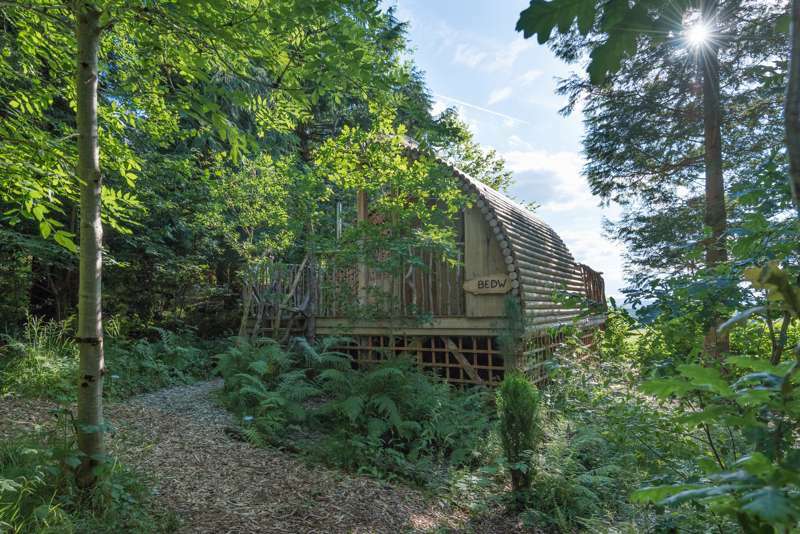 The Cabin, shared by both yurts, has a kitchen including a sink with hot water for washing up, a fridge for each yurt, a combi oven/ microwave/ grill, a kettle and toaster. Each yurt also has its own fully equipped kitchen hut with gas hob, table and chairs. Private composting toilet for each yurt. Excellent shower room and shower (big enough to share), also with a basin and hairdryer. Biodegradable shampoo, conditioner, shower gel and handwash all provided. There is a selection of games for inside and out, plenty of tourist information and OS maps to plan your day, and a small honesty shop. 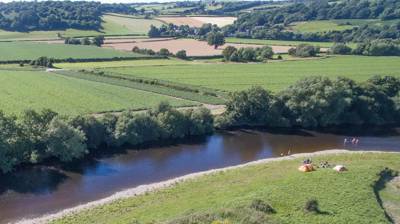 Take a picnic up to the farm's top field and enjoy the views out over the Black Mountains and Wye Valley. Or explore the 5000 acres of moorland that adjoin the field, listen for the curlews, look out for wild ponies or sit and ponder on the shores of the beautiful hilltop lake. 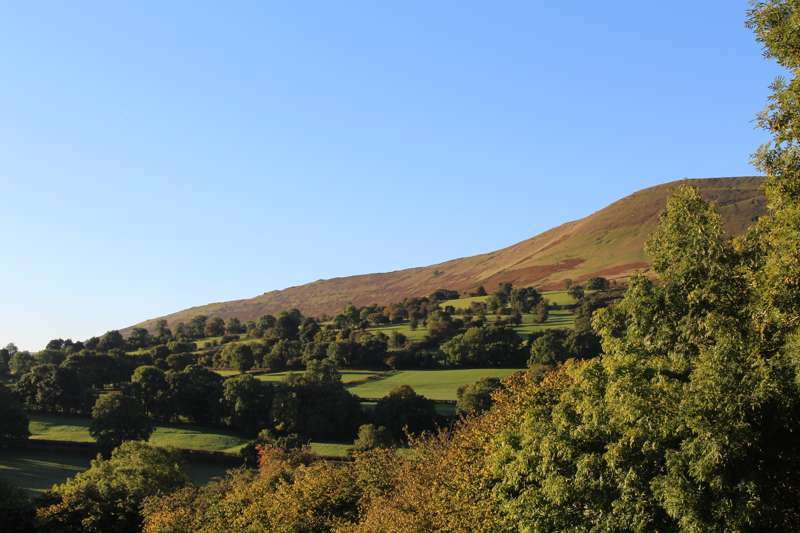 Two charming market towns, Brecon and Hay-on-Wye, are around 25 minutes drive away. Brecon hosts the Jazz Festival in August and Hay the Hay Festival in May/June. Builth Wells, a 15 minute drive away, or a 4 mile walk from the site along the Wye Valley Way, is home to the Royal Welsh Showground where events are held year round. For the energetic, horse riding is available from the Ellesmere Riding Centre (01874 658252) at Llangorse, or you can canoe down the Wye from Glasbury with Wye Valley Canoe Centre (01497 847213), plus, of course, there's cycling, mountain biking and hiking to be enjoyed in Brecon Beacons National Park. For fine dining, Llangoed Hall (01874 754525), just a few miles down the road, made the Sunday Times top 100 restaurants (No. 1 in Wales) in recently. Alternatively there are several pubs in nearby Builth as well as a fish and chip shop and a curry house. There is also a variety of good independent cafés, pubs and restaurants in Brecon and Hay. If you’re cooking for yourself, Builth Wells is handy for restocking with a couple of supermarkets and a prize winning local butchers. Maybe try a 'low ‘n slow’ roast on the Weber BBQ. If you can’t bear to leave the site and don’t fancy cooking for yourself the owners can also supply delicious home cooked meals. Check their website for more details. Driving from the direction of Brecon/Hay towards Builth Wells on the A470, pass through the village of Erwood. Continue for about a mile and take a left turn sign-posted Dol-llyn-wydd. Head up the steep single track country lane for about 2 miles. Look for a sign to Kite Hill Yurts to your left. When you cross the second cattle grid turn immediately right at the dormer bungalow, signed to Kite Hill Yurts. Park by the farmhouse and they will transport your luggage to your yurt for you. N.B. most SatNavs and Google Maps will take you to the neighbouring farm. Railway station at Builth Road (0845 748 4950; 4½ miles). Buses to Builth Wells from Cardiff or Brecon. 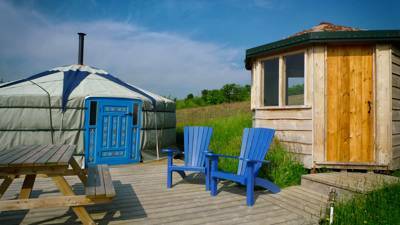 A pair of traditional 5m Mongolian yurts, each sleeping up to 5 people.